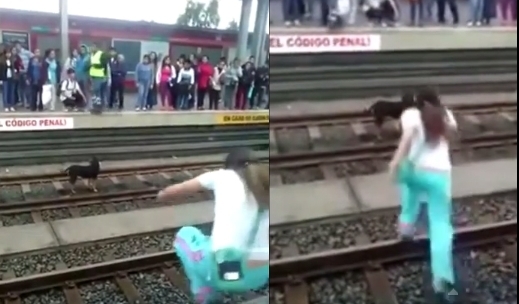 A woman who saved a dog after it fell onto some train tracks in Lima, Peru, could face jail time and a possible lawsuit for her actions, AOL reports. The dog, who belonged to a pedestrian waiting for the train (she's the woman wearing red in the video above), somehow escaped, ending up on the tracks. It tried jumping back onto the platform a few times, to no avail. But because dogs are awesome and people still have hearts, another woman (she's the one in teal) jumped down onto the tracks to save the dog. Both she and the dog were OK. Happy ending, right? Not quite. La Republica newspaper reports that Metro de Lima administrators argue that going onto the tracks for any reason is illegal and punishable with jail time (the organization posted a reminder on its official Facebook page too). Subsequently, Metro de Lima is reportedly considering pressing charges against the woman, though it remains unclear whether the organization actually will. People have been taking to Twitter to voice their support for the woman, with some calling her a hero and arguing that Metro de Lima could afford to let the rules slide in this case, since she saved the dog, and no one was hurt. Responses to "Brave Woman Faces Jail Time After Saving Dog From Train Tracks"
She should get a medal - what a wonderful woman and outcome. Good people get punished, criminals get away with a slap on the wrist. What a screwed up world we have created. Everything is upside down. It's not supposed to be like this. excellent job! i doubt they'll go through with the charges; i'd be beyond idiotic. She's brave, I hope they don't press charges. The world needs more people like her!! Respect! Bureaucracy at its best no matter what country you live in, she deserves a medal. She deserves a medal for rescuing the dog.